The deal was to meet on the corner of Collins and Elizabeth streets at 4.30 in the afternoon. As a professional. l had read many articles and researched Eddie Zammit, the T-shirt guru, online. Removing the veneer of professionalism and being the teenager that l am, I was overwhelmed with excitement that l was going to have the opportunity to meet one of my biggest inspirations, face to face. His mannerisms and charm took me by surprise, friendly and very inviting. He was happy to do the interview in his apartment. The space resembled a gallery filled with artwork from many facets of life, all with amazing stories; Eddie was ready to tell me them all with enthusiasm, as if they had happened just yesterday. Instantly, l was knocked out with an overload of creativity and a greater appreciation for art. Eddie attributes his passion for art and T-shirts to a book he opened in Year 9. In it was the description of an art director as “one who executes, supervises, or coordinates designs, illustrations, and layouts to be used in printed matter”. In that instant he knew what path he would take. He also took an interest in T-shirts at around 15 years of age. Not surprisingly, like many teenagers, Eddie did not like what his mum would buy for him. As his T-shirt collection grew, he noticed that the focal point of conversation with his friends was his T-shirts. Eddie remembers clearly that one of his favourite T-shirts in the early days was relatively plain and featured a barcode design but, instead of the numbers you generally find under the barcode, it had the word “shoplifter”. Yet what was really brilliant about this T-shirt, according to Eddie, was that the designer had “installed a mechanism in the sleeve that would beep every time you went through the security gates at a retail outlet; it actually set the alarms off”. It was at this stage that Eddie realised that “it was more than just a T-shirt, it was a conversation point”. For Zammit a T-shirt is not just a top you wear when everything else is in the wash or not ironed. A T-shirt can be a way of expressing who you are, it can talk for you, it can give your life colour. A T-shirt symbolises art, history and memories on fabric. Eddie maintained his own design company for over 13 years and worked as the art director on over 600 magazines and exhibitions before beginning T-world, “the world’s only T-shirt journal”. Eddie refers to T-world as a reference guide, a journal, not a magazine. It’s a “documentation of a culture, that l document personally”. Eddie is passionate and dedicated and has worked for a long time in the industry to gain the respect of T-shirt and design aficionados. His first exhibition featured only nine T-shirts. Yet continuing to work Zammit believed in his own talent and his dedication to his craft never ceased. In time his perseverance and dedication led him to hold exhibitions for Mambo and other designers at the National Gallery of Victoria. From there, Zammit’s success only continued to grow. 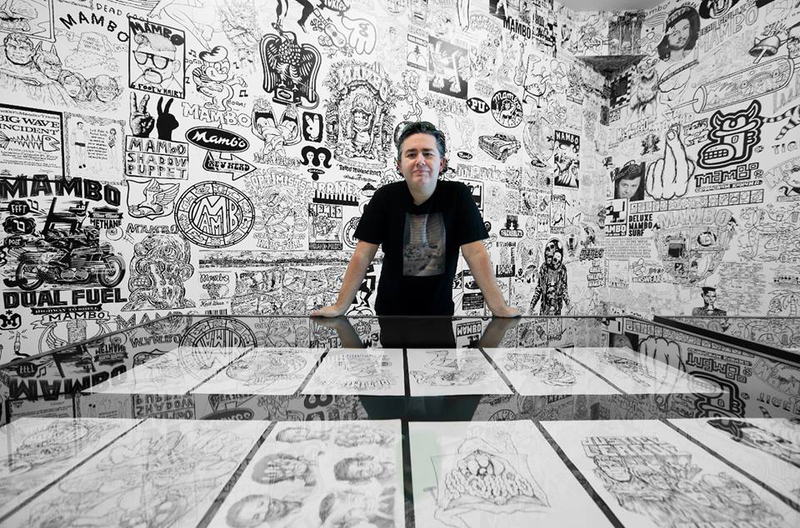 Eddie curated the world’s largest T-shirt exhibition at the Canterbury Museum in Christchurch, which was visited by as many as 230,000 people. However, according to Eddie, the hardest exhibition so far was the one in Melbourne in the Industrial Hall, which saw him camping out in his exhibition space over 10 days. Today, Eddie Zammit is one of the most sought-after art directors globally. Along the way he also happened to collect a lot of T-shirts — one turned into two and two turned into over 7000. The collection remains ever growing with Eddie receiving over 100 T-shirts a week. So what does he do with so many tees? Eddie believes “it is an obsession turned passion and that there is a difference between a hoarder and a collector because l have gone on and done something with the collection”. Eddie believes that, despite 100 years in the making, “we are only at the start of the T-shirt culture”. When you speak to someone like Eddie, it is always interesting to find out what or who inspires them. Eddie grew up with four things that influenced his type of aesthetic and these were: The Muppet Show, Sesame Street, Lego and Star Wars. A few years ago Eddie was lucky enough to live out his childhood dream by actually getting to Sesame Street. After a chance encounter with a friend led to an invitation to visit the set of the famous childhood show, Zammit couldn’t resist meeting Jim Henson’s colourful creature creations. Following on from his visit to the set, Zammit managed to pitch the idea of collaborating with Sesame Street on a massive 40th-year anniversary exhibition of Sesame Street’s T-shirts, which was wildly successful. When you talk to Eddie, it is hard to believe that someone so young has achieved so much. Eddie sees the dream and goes for it. You can sit back and say “wow, he was lucky”. But luck has little or nothing to do with it. Eddie’s perseverance, determination and enthusiasm are infectious and the few hours we spent together talking filled me with a drive to succeed and the knowledge that anything is possible, even figuring out how to get Sesame Street. If you’re interested in learning more about Eddie Zammit and T-world, head to http://www.t-world.com.au/ and be inspired.